After its nearly two-decade sabbatical from the American market, Alfa Romeo returned to present its new luxury SUV, the Stelvio. The Stelvio is a benchmark vehicle in more than one way. This is the first crossover SUV from the Italian company, and boy does it set a precedent. Its performance, power, premium standards, and engineering passion is evident within all five of its trims, giving us the fastest production crossover SUV: the Stelvio Quadrifoglio. 2019 presents new styles, new technology, and inclusion of rear-wheel drive configured vehicles for every trim! What amenities does the 2019 Stelvio include standard? Muscular and fluid, the 2019 Stelvio possesses all the premium detailing and craftsmanship you'd expect out of fine Italian engineering. Even being a crossover SUV, the vehicle doesn't allow a larger build to hinder its luxurious decadence. The long hood and sloping windshield angle makes for an image of aerodynamic perfection, with prominent triangle design cues in the signature grille, headlight design, and scalloped hood. At the same time, the power operated tailgate and 8.1-inch ground clearance provides a level of utility with regards to cargo, inclimate weather, and even some light trail travel. Inside, the two-row five-passenger cabin is spacious, coming with premium leather upholstery standard upon your choice of standard or sport bucket seats. Cargo space is an adequate 18.5 cu.ft, with a total of 56.5 cu.ft available when the 60/40 rear row is folded flat. Standard features also include ten-way power front seats, dual-zone automatic climate control, rain-sensing automatic wipers, reverse camera, rear parking sensors, and either a 6.5- or 8.8-inch infotainment touchscreen. This comes with Bluetooth, Apple CarPlay, Android Auto, HD radio, and four USB outlets. 18-inch wheels come standard, but there are upgradable choices in either 19- or 20-inch designs. Three new appearance packages debut in 2019 to add to the Stelvio's sophistication and unique design. One new paint option has been added for the new model year to make a total of thirteen amazing color options, and a total of ten interior color palettes really make an extensive amount of aesthetical choice already! All five trims of the Stelvio gain a Nero Edizione detailing package. This touches up the appearance inside and out with dark miron coloring upon the exhaust tips, badges, mirror caps, and signature V scudetto grille. Also added are 20-inch miron black aluminum wheels with monochromatic caps and all-season performance tires. You have your choice of black brake calipers, or you can provide a burst of color with either red or yellow caliper coloring. Next appearance package is the Ti Sport-exclusive Carbon Package, providing similar detailing in carbon coloring. Lastly, the Quadrifoglio gains a Carbon Fiber Package, providing carbon fiber grille, mirror caps, dark miron Stelvio badging, and 20-inch Dark 5-Hole aluminum alloy wheels. How fast are the powertrains? Handling and performance are Alfa Romeo's pride and joy next to exceptional luxury style and technology, and the Stelvio does not disappoint in the slightest. It's perfect 50/50 balance gives this SUV class-leading power in both of its engine options. First up is a 280 horsepower, 306 lb-ft torque 2.0L direct injection turbocharged four-cylinder engine with intercool technology. This engine gives a zero to sixty mph takeoff in just 5.4 seconds. The performance specialized Quadrifoglio receives an exclusive 2.9L twin-turbocharged V6 powertrain, generating best-in-class 505 horsepower and segment-leading 443 lb-ft of torque. This improves on already exceptional speed, providing zero to sixty mph performance in just 3.6 seconds with a top speed of 176 mph. This is the fastest production SUV in the world, as evident by its 7:51.7 lap time through the famous Nürburgring track. Both these engines come with an automatic eight-speed transmission. While previous years only came in AWD, 2019 provides all new rear-wheel drive configurations throughout the trim selections! 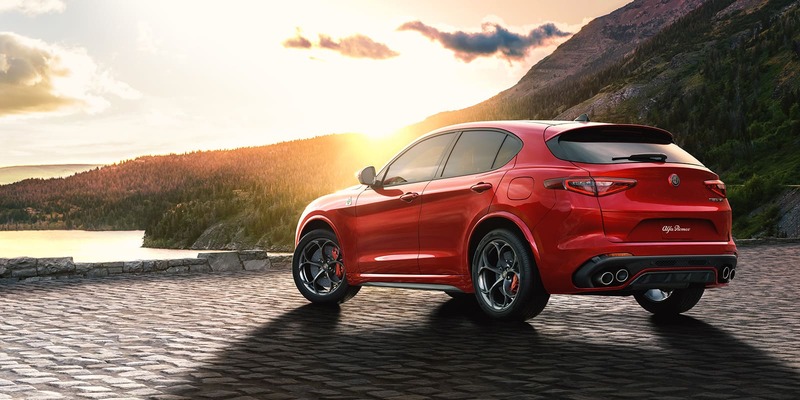 Speedy, stylish, and sophisticated, the 2019 Alfa Romeo Stelvio suits those who want a spacious luxury vehicle that suits cargo needs and state of the art technology wants. Engineered with emotion--as goes Alfa Romeo's brand "la meccanica delle emozioni" principle--the passion and pride of this Italian company exudes from every facet of the Stelvio's build.